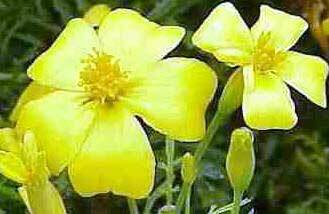 We offer Tagetes Oil to the client, which is extracted from Tagetes minuta. Tagetes Oil has a wild, sweet, fruity almost citrus-like smell and is yellow to reddish-amber in color. The Tagetes Oil is of medium viscosity that can turn thick and even gel-like if exposed to the air for a long time. Tagetes oil is extracted from the leaves, stalks and flowers, picked when the seeds are just starting to form. The Tagetes Oil is provided in different packaging to meet the requirements of the clients. Tagetes oil is very powerful oil and should be used sparingly and should be avoided during pregnancy. Not to be used on a sensitive skin and may cause photosensitivity. Cases of dermatitis have been reported.